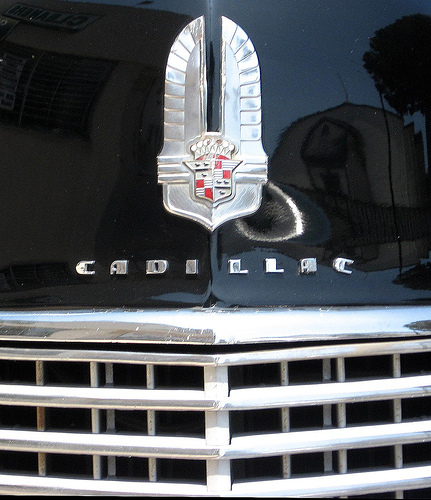 For nearly five decades, Cadillac was the standard-bearer for luxury cars in America. That dominance was not won through technical innovation or forward-thinking product development, but through styling leadership. Although the division produced some gorgeous cars in the early thirties that are acknowledged as classics, Cadillac’s position as a true styling leader can be traced to one car: the 1938-1941 Cadillac Sixty Special. This enormously influential model was laden with then-radical features that have since become the industry norm. The Sixty Special also launched the career of William L. (Bill) Mitchell, GM styling chief Harley Earl’s eventual successor and one of the most influential men in the history of the American automobile. This is the story of the Sixty Special. Harley Earl’s people called him “Misterl” — the honorific was so automatic that it might just as well have been part of his name. In an organization that epitomized corporate conformity, Earl was a distinctive and imposing figure in every way: 6’4″ (1.93 m) tall and over 250 pounds (114 kg), with a rakish sense of personal style that ran to tailored white suits and blue suede shoes. He even maintained a wardrobe in his office so that he could select an outfit to suit each situation. Earl was gruff and less than articulate, in part to cover up a mild stutter about which he was very self-conscious, but he had a sense of showmanship to rival P.T. Barnum. Unlike most GM execs, who came from Detroit and cut their teeth on its automotive culture, Harley Earl was from California. In 1925, the 31-year-old Earl was working in a custom body shop run by Cadillac’s West Coast distributor, Don Lee, developing bespoke bodywork for wealthy customers. His work came to the attention of Cadillac’s new general manager, Larry Fisher, who was preparing a new ‘near-luxury’ companion car for Cadillac, the LaSalle. Fisher arranged to bring Earl to Detroit to design it. Up to that time — and for a good while afterward, at some companies — cars were generally designed by engineers, not artists. If there were aesthetic stand-outs, they were the work of independent coachbuilders and customizers. For a mass-market car to be designed by a stylist was something new, but the 1927 LaSalle proved to be highly successful and very influential. Harley Earl initially came to GM on a short-term contract for Cadillac, but GM president Alfred P. Sloan was so impressed with his work that he commissioned Earl to build a new Art & Colour [sic] section, the auto industry’s first full-fledged styling department. By the mid-thirties, Earl had a sizable staff divided into separate studios for each GM division, as well as advanced-design groups that developed more experimental themes for future use. Earl had a rocky start at GM, frequently warring with the engineering staff and many of its more conservative executives. Earl was utterly fearless and he had a ferocious temper. The fact that a man of such ego and temperament survived in the conservative corporate culture of GM was thanks largely to the unwavering support of Alfred Sloan, who allowed Earl privileges enjoyed by no other GM employee. Earl received this latitude for one simple reason: his work sold cars. 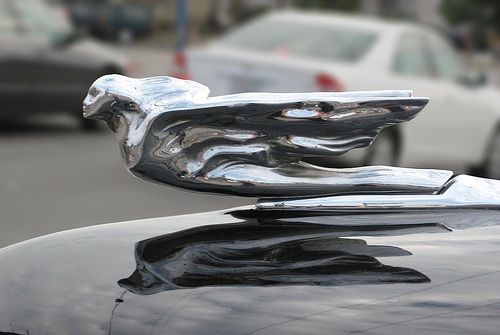 Cadillac’s traditional flying-lady hood mascot, seen here on a 1941 Cadillac Sixty Special would grow progressively more abstract as the years progressed. We should emphasize that during most of his tenure at GM, Earl was not a stylist in the conventional sense. He didn’t draw or mold clay and his staff rarely saw him with a pencil in hand. He oversaw a steadily growing army of artists, modelers, and body engineers, whom he directed with a language of grunts, gestures, and oblique euphemisms. All of the designs created during his reign, however, bore his influence. William L. Mitchell, born in Cleveland, Ohio, in 1912, was the son of a Pennsylvania Buick dealer. A long-time racing aficionado, by his early twenties, Mitchell had also become a skilled artist. In the summer of 1935, Walter Carey, a family friend and an acquaintance of Harley Earl’s, suggested Mitchell put together a portfolio to submit to GM. Late that year, while waiting for an interview with Earl’s administrative assistant, Howard O’Leary, Mitchell struck up a conversation with Earl without knowing who he was. Earl liked the young man immediately and hired him on December 14, 1935. Once Mitchell had proven his skills, Earl made him the head of the Cadillac studio. Cadillac had been on the verge of liquidation in the early thirties; despite its impressive, stylish V-12 and V-16 cars, its total sales were dangerously low. To shore up business, a new ‘entry-level’ model, the Series Sixty, was added for 1936, with prices starting as low as $1,645. That was still a lot of money, but it was more than 30% less than the cheapest 1935 Cadillac. Sales doubled to more than 12,000, but the line still seemed in need of new blood. The original Cadillac Sixty Special was based on the Series 60, introduced in 1936 as Cadillac’s cheapest line. The 1937 was 201.3 inches (5,112 mm) long on a 124-inch (3,150mm) wheelbase, weighing a bit over 4,000 lb (1,820 kg) with a fuel tank of fuel; 1938 cars had the same wheelbase, but were 6.4 inches (162 mm) longer overall and around 90 lb (41 kg) heavier. Earl thought a stylish new image leader might help and made that project one of Bill Mitchell’s earliest assignments. Although the design was primarily Mitchell’s work, it developed styling concepts that Earl and his team had been exploring for several years. Earl initially conceived the car as a new LaSalle, so early clays wore LaSalle badges, but along the way, it became a full-fledged Cadillac. Based on the body of the Series Sixty, it was dubbed the Cadillac Sixty Special. The 1937–1938 Cadillac Series 60 sedans did have an integral trunk, but from an aesthetic point of view, the superiority of the Sixty Special is hard to argue. The original Cadillac Sixty Special was a groundbreaking design in ways that are not necessarily easy for a modern viewer to recognize. To understand why the Sixty Special was significant, it’s important to recall that the typical closed American car of this era was tall, rigidly upright, and relatively narrow. The sides of the body itself seldom extended much beyond the frame rails, so the fenders and running boards made up much of the average car’s overall width. “Trunkback” sedans with a distinct rear deck enclosing a separate luggage compartment had only begun to appear over the previous two or three years; most closed sedans had no separate trunk, instead storing luggage in the space behind the rear seats. The 1938 Cadillac Sixty Special’s “notchback” profile set an industry trend that continues today. The 1938 car was 207.6 inches (5,274 mm) long on a 127-inch (3,226mm) wheelbase, reduced to 126 inches (3,200 mm) for 1941. The Sixty Special, developed by Mitchell under Earl’s close supervision, was a significant move away from that mid-thirties orthodoxy toward what we would now recognize as the modern notchback sedan. The design also embodied the longer, lower, wider dictum that would characterize most of Harley Earl’s GM career. The Sixty Special’s overall length was actually no greater than that of the standard Series 60 — 207.6 inches (5,274 mm) — but the Sixty Special rode a 127-inch (3,226mm) wheelbase, 3 inches (76mm) longer than the Sixty’s, and stood 65 inches (1,651 mm) high, 3 inches (76 mm) lower than the regular Series 60. Although the 1941 Cadillac Sixty Special uses the same body as the 1938-1939 cars, it rides a slightly shorter 126-inch (3,200mm) wheelbase and is about 10 inches (25.4 mm) longer overall, with the extra length coming mostly in the nose. Note the absence of side mounts; they were finally dropped from the options list in 1941 because they weren’t compatible with the new front fenders, which now extended backwards into the doors. The rubber splash guards on the rear fenders were another feature added subsequent to the original version. Although overall widths were similar, the Sixty Special’s body sides were wider than the Series 60’s and there were no running boards. Unlike other 1938 Cadillacs, whose body sides were basically vertical from running boards to side windows, the Sixty Special’s greenhouse was slightly narrower than the body sides, which rolled gently inward at the beltline to fill the gap. 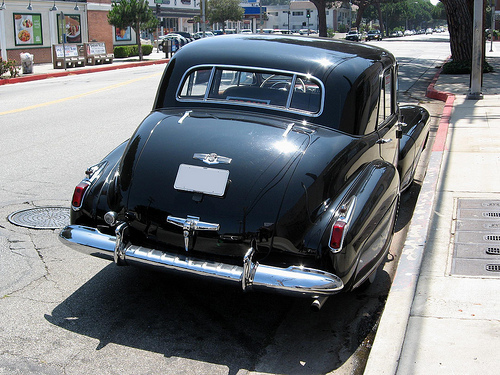 The curvaceous rear deck, which contained both the luggage compartment and the spare wheel, looked more like the tail of a roadster or rumble seat coupe than of a sedan; most contemporary trunkback sedans had stubby trunks that created an awkward hunchback profile. 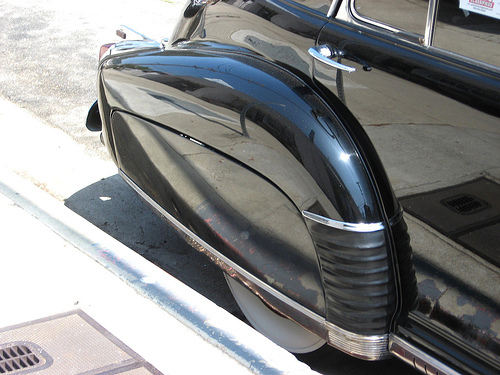 Unlike other 1938 Cadillacs, the Sixty Special had no running boards. Unlike the Panhard Panoramic that inspired this greenhouse treatment, the Cadillac Sixty Special does have window frames, although they’re very thin. The Sixty Special’s greenhouse was inspired by that of the 1934 Panhard 6 CS ‘Panoramic,’ which Earl and GM president Bill Knudsen had seen and loved when it debuted in Paris a few years earlier. 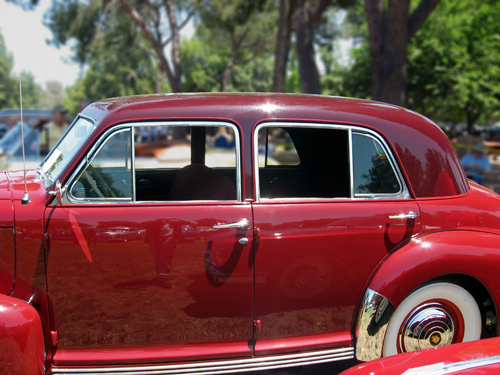 Like the Panoramic, the Sixty Special had delicate-looking A- and B- pillars with thin chrome window reveals, a sharp contrast with the bulky-looking body-colored window frames of other 1938 Cadillacs. Neither the Panhard nor the Sixty Special was a pillarless hardtop in the postwar sense, but their thin A- and B-pillars and broad, rounded sail panels foreshadowed that aesthetic. 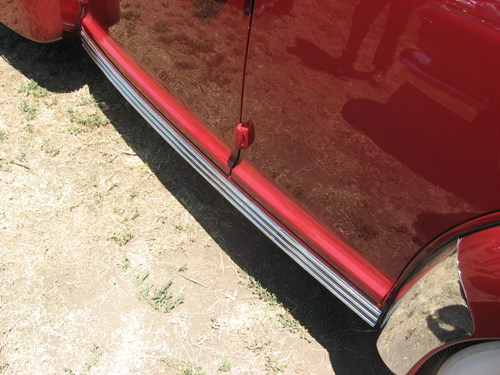 Another novelty was front-hinged doors; many four-door sedans of this era had “clap-hands” doors, with the rear doors hinged at their trailing edges. From this angle, you can see the curved beltline below the Sixty Special’s side windows and the sloping, coupe-like trunk. The soft lines of this car look a little pudgy to modern eyes, although it was all quite advanced at the time. The one retrograde touch was side-mounted spare tires. These were an expected feature of high-end cars of the late thirties, by this time usually fitted with body-colored covers that served as an additional place to mount bright trim and ornamentation. Mitchell’s designers were already weary of side mounts, but the feature were eventually offered as an option, perhaps to placate Cadillac general manager Nicholas Dreystadt and sales director Don Ahrens. The side mounts provided greater styling continuity with the rest of the line, but the Sixty Special looked better without them. 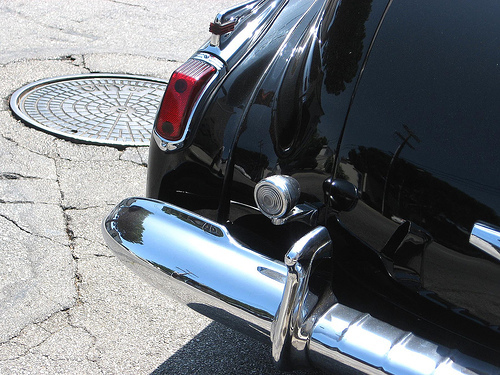 The 1941 Cadillac Sixty Special’s left tail light flips up to reveal the fuel filler — a new trick for 1941 and one that would endure for decades. Note the single back-up lamp; back-up lights cost $7.50 each in these days, and most people ordered only one, if they ordered them at all. Both Dreystadt and Ahrens were very concerned that the Sixty Special would be too radical for conservative Cadillac customers. It was rakish for a Cadillac — perhaps too rakish for any domestic luxury sedan — and there was considerable fear that Earl and Mitchell had gone too far. In retrospect, it’s harder to understand those objections because modern eyes notice mostly those feature that have become obsolete, such as the divided front and rear windshields, the bulbous hood, and the separate fenders. By contrast, the elements of the Cadillac Sixty Special’s design that made Ahrens and Dreystadt so nervous no longer look particularly unusual. The production Sixty Special was offered only as a four-door sedan. Several other Sixty Special body styles were contemplated, including a three-window coupe, which really does look rakish to modern eyes, and a convertible sedan. As it was, Earl was pushing his luck to get the sedan approved and none of the other body styles saw series production, although one coupe and four convertibles were built for the use of GM executives. Mechanically, the 1938 Cadillac Sixty Special was largely identical to the Series 60, although the Special had a unique “double-drop” frame that allowed a lower cabin floor, ensuring that the lower overall height would not compromise headroom. The body was mostly steel, but the Sixty Special’s sills were wood and wooden bracing was used around the rear windows. Like most of GM’s upper-division cars of the time, front suspension was independent, with lower wishbones, coil springs, and Delco lever-action hydraulic shock absorbers that doubled as upper control arms. Rear suspension was a live axle on parallel semi-elliptical leaf springs with a rear anti-roll bar. Worm-and-roller steering was relatively light, but rather slow. Sources are inconsistent about whether or not fender skirts were standard on 1941 Cadillac Sixty Specials — they’re listed as a $17.50 extra on the options list, but few cars seem to have been sold without them. They unbolt with wing nuts to allow tire changing, a cumbersome operation. Under the hood was Cadillac’s 346 cu. in. (5,676 cc) “monobloc” L-head V8, offering 135 gross horsepower (101 kW) and 250 lb-ft (338 N-m) of torque. The V8 was linked to a three-speed manual transmission with synchronized second and third gears. The Sixty Special’s extra length and width made it some 230 pounds (105 kg) heavier than a Series 60 sedan. At $2,085, the Special also cost $310 more — a hefty premium in an era when a Chevrolet Master DeLuxe sedan cost less than $800. The 1941 Cadillac Sixty Special uses what is known as a five-window body (four side windows and backlight), although it also has front and rear Fisher No Draft ventilation, a feature GM had pioneered in 1933 with the Cadillac Aerodynamic Coupe, shown at the Chicago Century of Progress exposition. The design of the 1941 grille, known internally as the “tombstone” grille, is generally attributed to designer Art Ross and took its inspiration from the Art Deco buildings along Los Angeles’s Wilshire Boulevard (many of which sadly are gone today). Ahrens’ and Dreystadt’s fears that the Cadillac Sixty Special’s styling would alienate conservative buyers proved ill-founded; the Sixty Special quickly became Cadillac’s best-selling individual line. Cadillac sold 3,704 in the initial 1938 model year despite a national recession. Such sales were modest by GM standards, but quite good considering the Sixty Special’s price and the fact that total Cadillac sales five years earlier had been only 3,173. The 1941 Cadillac Series 62 was a relatively fast car, capable of 0-60 mph (0-97 km/h) in around 16 seconds and a top speed of about 95 mph (153 km/h) with manual shift. The heavier Sixty Special with Hydra-Matic probably took around 20 seconds to reach 60 mph (97 km/h), although even that wasn’t bad by the standards of the day. The basic Series 60 was dropped for 1939 in favor of a new, price-leader Cadillac Series 61, but the Sixty Special continued, now sporting a new, pointed nose that stretched its overall length to 214.3 inches (5,442 mm). The Sixty Special’s body was now built by Fleetwood, a formerly independent coachbuilder that GM had acquired to build bodies exclusively for Cadillac, lending a bit of extra prestige. Despite a price $110 higher than in 1938, 1939 sales climbed to 5,513. 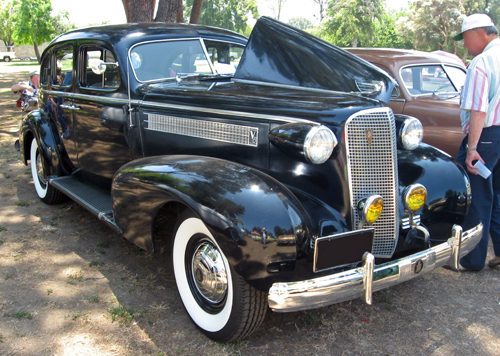 Starting in 1939, Fleetwood also produced a small number of divider-window sedans for chauffeur-driven customers; there were also a handful of pricey town cars with an optional leather top covering. A sunroof, dubbed “Sunshine Turret Top,” was also available, although it was very rare. 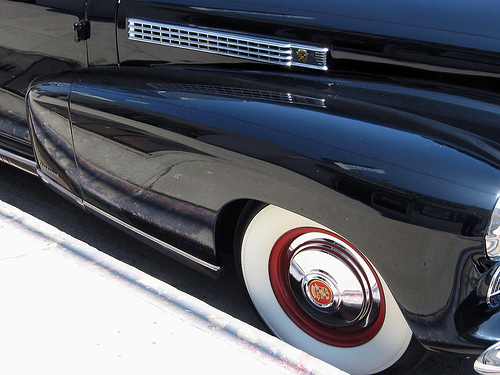 The 1941 Cadillac’s grille texture is repeated in the vents along the sides of the hood, which are known to stylists as “catwalks.” The “sombrero” wheel covers were a popular option, costing $4 each. As was Earl’s wont, the styling features of the Cadillac Sixty Special began to appear in other GM lines starting in 1940, beginning with the new “torpedo” C-body shared by the big Buicks and Oldsmobiles as well as Cadillac’s own Series 62. Predictably, once the Sixty Special became less distinctive, its share of Cadillac sales eroded. 4,600 were sold for 1940, but it was now second to the derivative, $245 cheaper Series 62. 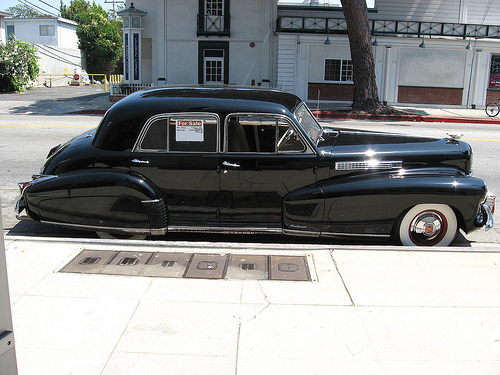 The original Cadillac Sixty Special got one final fling for 1941, which is the year of our black photo subject. Although the Sixty Special’s wheelbase had been shortened by an inch (25 mm) in 1940 to match the new 126-inch (3,200mm) span of its siblings, it was a little over 3 inches (76 mm) longer than before. Side mount spares were dropped from the options list. 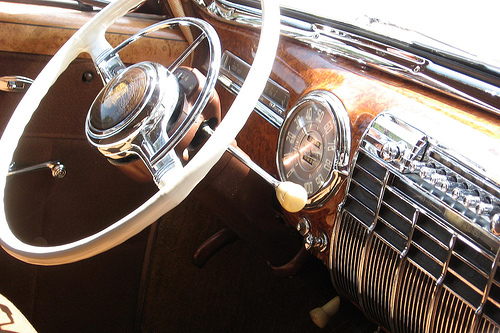 Heaters were not standard in those days, even for Cadillacs. 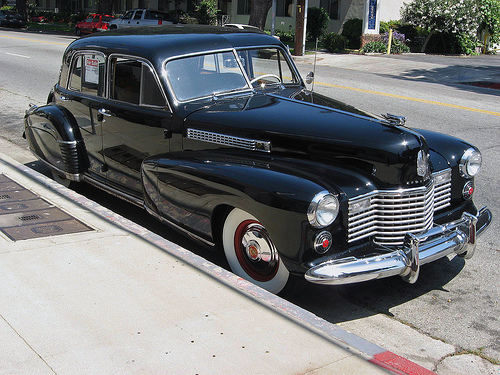 This 1941 Cadillac Sixty Special has the $69.50 deluxe heater. 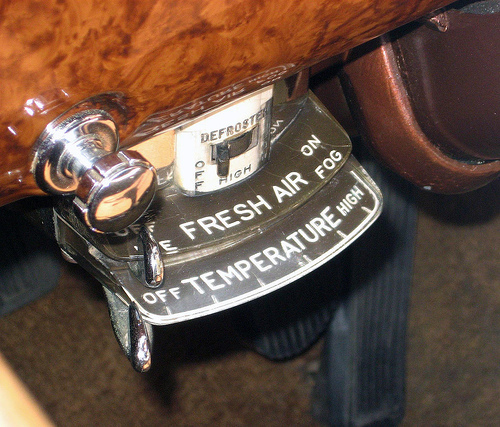 Flipping the “fresh air” switch opens the vent at the base of the windshield. The cowl vent flips up when the interior switch is moved to the fresh air position. Most modern cars still take their ventilation air from this high-pressure area at the base of the windshield, albeit through a recessed duct rather than a raised vent. The biggest changes were up front. The separate headlight pods were gone, replaced by flush headlamps in the front fenders. (Earl had been pushing for this change for years, but GM president Bill Knudsen had repeatedly overruled him, insisting that flush headlights were impractical.) There was also a dramatic new eggcrate grille that extended laterally into the front fenders, a design that would become a Cadillac trademark. 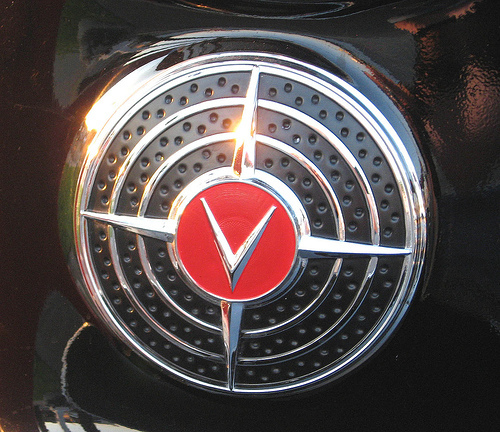 The V emblems don’t do anything other than fill the space that would otherwise be occupied by the optional fog lamps, which this car does not have. 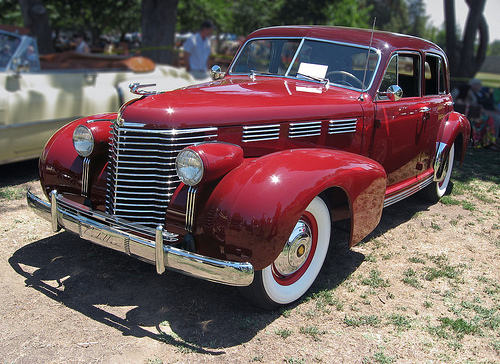 1941 Cadillacs still had the 346 cu. in. (5,676 cc) V8, now up to 150 horsepower (112 kW); the slow-selling V-12s and V-16s were gone for good. Under the hood was a radical new drivetrain option, the four-speed Hydra-Matic. Introduced the previous year by Oldsmobile, it was the world’s first fully automatic transmission, and Cadillac became the first luxury automaker to offer such a feature. 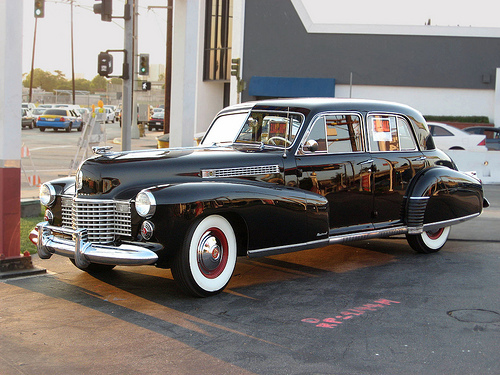 Some buyers were suspicious of it — not without reason, as the early H-M had some teething problems — but about 30% of 1941 Cadillacs were so equipped at a premium of $125. By the end of the decade, it would be standard on most Cadillac models. The Sixty Special, now up to $2,195, still looked sharp, but it had been overshadowed both by the Series 62 and the slick new fastback Series 61 coupe. Exactly 4,100 Sixty Specials were built for 1941, the last year for the original body. 1941 Cadillac interiors had real wood and leather and lots of chrome and Bakelite trim, although you paid extra for radio and heater. The quadrant atop the steering column indicates that this car has Hydra-Matic. The 100-mph (160-km/h) speedometer is only slightly optimistic — with a well-tuned engine and a long run, 90 mph (145 km/h) is certainly feasible. 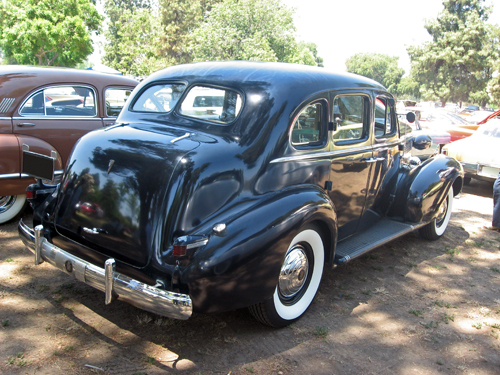 For 1942, the Sixty Special was restyled, becoming a stretched Series 62 sedan, distinguished mostly by its greater length and the chrome hash marks on its front and rear fenders. Sales dropped to 1,875, although the decline reflected the fact that the 1942 model year ended in January 1942, about seven months earlier than normal, by order of the War Department. Cadillac could easily have dropped the Sixty Special after the war, but the model returned for 1946 and remained part of the Cadillac line-up until 1976. The name was revived from 1987 to 1993. About a month before the 1941 models went on sale, Harley Earl became a vice president of General Motors. Although the elevated title did not significantly alter his actual duties, it was a sign of his growing influence and power within the corporation. At Chrysler, dominated by engineers, such a move would have been virtually unthinkable, but Alfred Sloan realized early on, that much of GM’s market dominance relied on what a later generation would call “selling the sizzle” — sizzle that Earl and his designers provided. Bill Mitchell became the head of the Cadillac styling studio in 1938. In 1947, he briefly departed GM to run Harley Earl’s outside styling firm, the Harley Earl Corporation (HEC). (Allowing Earl to have his own separate company was one of the unique privileges Sloan allowed him, the main proviso being that HEC not directly compete with any GM division or subsidiary.) Mitchell returned to the GM fold in 1953 as director of design. On his return, Earl told Mitchell that he would be GM’s next VP of design. Late in his career, Harley Earl started to lose his touch, most evidenced by the bloated, chrome-encrusted ’58 models, which proved to be a sales disaster. While Earl was in Europe during the design of the ’59 models, Bill Mitchell led a ‘palace coup‘ that radically redesigned the cars along cleaner if no less glitzy lines. Perhaps realizing his day was done, Earl eventually accepted the new approach and helped to refine the styling of the ’59s, but the direction was now Mitchell’s, not Earl’s. When Earl reached GM’s mandatory retirement age in 1958, he was gone. He died in 1969 at the age of 75. On December 1, 1958, Mitchell was promoted to vice president, becoming head of the department now known simply as Design; the Art & Colour title had been retired back in 1937. Although he had broken with his mentor aesthetically, Mitchell’s respect for Earl was undimmed and he possessed a similar sense of style and showmanship. According to his former employees, Mitchell expected them to look as good as the cars they drew and he was known to send a man home to change if he disapproved of his sartorial choices. Mitchell was also Earl’s match in pugnacity, profanity, and temper. Mitchell’s former colleagues characterized him as a bigot, a womanizer, and a heavy drinker who was prone to fits of temper even when sober. Unlike Earl, Mitchell didn’t have Alfred Sloan as a patron — Sloan had retired in 1956 — and his confrontational attitude led to many clashes with both division leaders and upper management. Even so, during his 19-year reign, Mitchell presided over classic designs like the 1963 Buick Riviera and Corvette Sting Ray, the 1965 Chevrolet Corvair, the 1967 Cadillac Eldorado, and the original Chevrolet Camaro. Like Earl, Mitchell did not design any of these cars himself, but he set the direction and the tone. Mitchell retired in 1977 and after he was gone, GM styling slipped into the doldrums. Ironically, one of the last designs and most controversial designs Mitchell supervised was Wayne Kady’s 1980-1985 “bustleback” Cadillac Seville, a deliberate throwback to the early-thirties styling cues that Mitchell’s Sixty Special had made obsolete. Mitchell died in 1988. 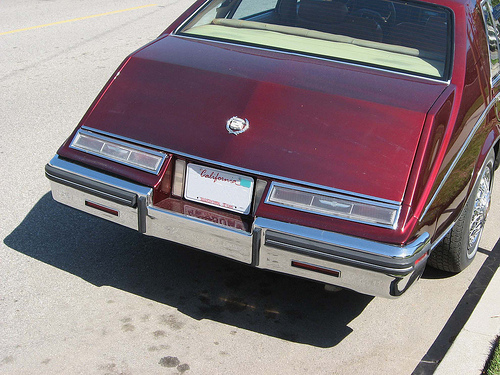 The 1980-1985 Cadillac Seville’s bustleback tail was designed to evoke the add-on accessory trunks that faded away in the late 1930s, in part because of the Sixty Special. If Earl and Mitchell each had a well-deserved reputation for being temperamental, to some extent they were no more difficult than they had to be within the corporate culture of GM. They were artists in a business dominated by engineers and finance men, whose understanding and appreciation of aesthetics was highly variable. It took an enlightened executive like Alfred P. Sloan to see the value the designers could provide and give them the room to work. Since Mitchell’s departure 30 years ago, GM’s inherent conservatism has reasserted itself forcefully. GM has fielded some good-looking cars and a number of great-looking ones, but few, if any, of its designs have had the kind of unity of concept that Mitchell or “Misterl” would have demanded, something that eventually cost the corporation dearly. Our sources for this article included C. Edson Armi, The Art of American Car Design: The Profession and Personalities (University Park, PA: The Pennsylvania State University Press, 1988); the Auto Editors of Consumer Guide, Encyclopedia of American Cars: Over 65 Years of Automotive History (Lincolnwood, IL: Publications International, 1996); John Barach’s Cadillac History website, Motor Era, 1999-2007, www.motorera. com/cadillac/index.htm, accessed 23 July 2007; “Bill Mitchell, General Motors Head of Design,” Automotive News 1976; Terry Boyce, “1938 Cadillac 60 Special: Bill Mitchell’s Svelte Styling Breakthrough,” Special Interest Autos #62 (April 1981): pp. 10–17; Arch Brown, Richard Langworth, and the Auto Editors of Consumer Guide, Great Cars of the 20th Century (Lincolnwood, IL: Publications International, Ltd., 1998); Cadillac Motor Car Division of General Motors Sales Corporation, “Cadillac 1941 Accessory Data Book” [salesman’s guide, ca. September 1940], and “Data Book” [salesman’s guide], 13 September 1940; David R. Crippen, “The Reminiscences of William L. Mitchell” [interview], August 1984, Automotive Design Oral History Project, Accession 1673, Benson Ford Research Center, www.autolife.umd.umich. edu/ Design/Mitchell/mitchellinterview.htm [transcript], accessed 23 July 2007; Beverly Rae Kimes, ed., Standard Catalog of American Cars 1805-1942, Second Edition (Iola, WI: Krause Publications, Inc., 1989); Nick Georgano and Nicky Wright, Art of the American Automobile: The Greatest Stylists and Their Work (New York: SMITHMARK Publishers, 1995); David Halberstam, The Fifties (New York: Ballantine Books, 1994), pp. 116-130; Maurice Hendry and David R. Holls, Cadillac: Standard of the World: The Complete History, Fourth Edition (Princeton, NJ: Automobile Quarterly, 1990); Dave Holls and Michael Lamm, A Century of Automotive Style: 100 Years of American Car Design (Stockton, CA: Lamm-Morada Publishing Co. Inc., 1997); Michael Lamm, “GM’s Far-Out ’59s: When Imagination Ran Rampant,” Special Interest Autos #125 (September-October 1991), pp. 41-47; Alfred P. Sloan with John McDonald, My Years with General Motors (Garden City, NY: Doubleday, 1964); Rob Leichester Wagner, Cadillac: A Century of Excellence (New York: MetroBooks, 2002); and Paul Zazarine, “Personality Profile: Harley Earl: ‘DaVinci of Detroit,'” Collectible Automobile Vol. 22, No. 5 (February 2006), pp. 72–82. A fascinating read as always. GM has been without spark since the departure of DeLorean, the death of John Beltz, and the retirement of Mitchell. I’m not sure there has ever been a longer, sadder corporate decline. The 1941 60S HAD to have skirts. Otherwise, some of the fender stiffeners and splash pans would be visible.